Lightning Conger Ritual is in this post, if you're curious as to what brings this out and why I've decided to get wild with the alternative naming these days. 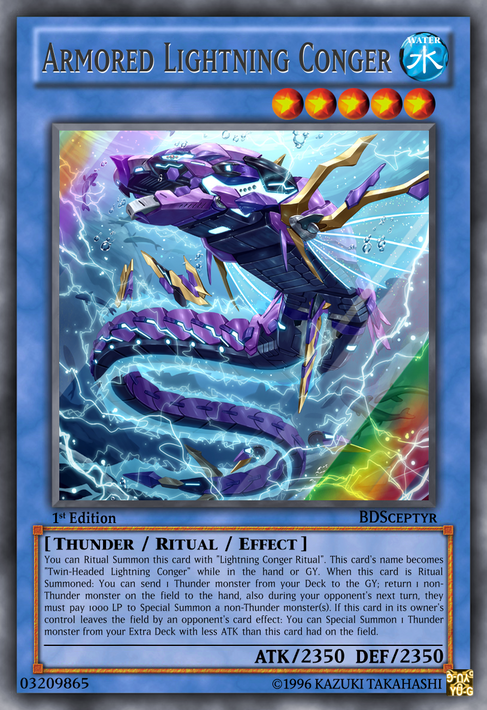 Lore: You can Ritual Summon this card with "Lightning Conger Ritual". This card's name becomes "Twin-Headed Lightning Conger" while in the hand or GY. When this card is Ritual Summoned: You can send 1 Thunder monster from your Deck to the GY; return 1 non-Thunder monster on the field to the hand, also during your opponent's next turn, they must pay 1000 LP to Special Summon a non-Thunder monster(s). If this card in its owner's control leaves the field by an opponent's card effect: You can Special Summon 1 Thunder monster from your Extra Deck with less ATK than this card had on the field. So right now, the power of the Lightning Conger lineup grows another foot. Destroys, mills, puts down a Special Summoning penalty, and floats. Good luck getting over stuff with this. But combine it with the Twin-Headed Lightning Conger's in-hand ability and well, Thunder Dragon Goliath's your uncle if your opponent gets fresh with this card. Considering the Type it supports, however, I still think it may balance out.